Established in 2000, SOLS 24/7 is a Malaysian-based NGO that provides an action learning-based education with boarding facilities for young adults who would not otherwise be able to attend school or participate in further and higher education. To-date, SOLS 24/7 has worked with some 90,000 young adults in seven South East Asian countries: Cambodia, East Timor, Laos, Singapore, Japan, Malaysia and Thailand. Train and develop underprivileged young adults so that they become skilled, responsible, dynamic, disciplined and socially conscious. Establish community centres in poor areas for the benefit of the community. Establish urban networks that provide participants with the necessary support to gain employment or start their own businesses that indirectly help rural economic development. 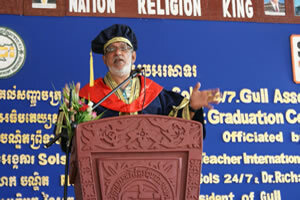 (Above) Madenjit Singh, Founder, SOLS 24/7 speaking at the inaugural GULL graduation, Cambodia, 31 January, 2013. 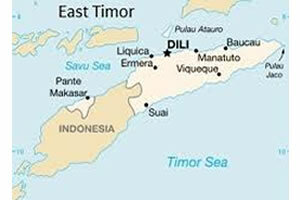 East Timor occupies 15,410 km2 (5,400 sq mi) with a population of just over a million people. It is located adjacent to Indonesia and comprises the eastern half of the island of Timor and several islands. Colonised by Portugal in the 16th century, East Timor gained its independence in 1975, but later that year was invaded and occupied by Indonesia. In 1999, Indonesia relinquished control of the territory and East Timor became the first new sovereign state of the 21st century on 20 May 2002. East Timor is one of only two predominantly Roman Catholic countries in East Asia, the other being the Philippines. East Timor has a market economy that is dependent upon exports of a few commodities such as coffee, marble, oil and sandalwood. It continues to suffer the after-effects of a decades- long independence struggle against Indonesia, which damaged infrastructure and displaced thousands of civilians. 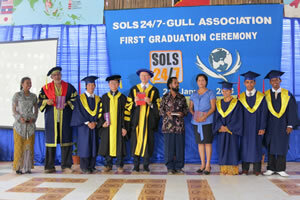 (Above left) GULL Regional President Vincent Tang with a SOLS 24/7 volunteer teacher, Dili, East Timor. SOLS provides holistic education that begins with innovative English language tuition. Most students are fluent in English in less than six months and this together with personal development are the central themes of stage 1. Stage 2 introduces leadership together with business skills training and at Stage 3 students transfer to community centres to teach new students. Stage 4 provides a wider exposure to business disciplines and personal and professional development. (Above right) Graduation guests included the Director General of Education and senior civil servants from the Ministry of Petroleum, East Timor. Since its inception in 2000, SOLS has developed highly effective peer modelling procedures that enable students to consolidate their personal and professional development by teaching more junior students. 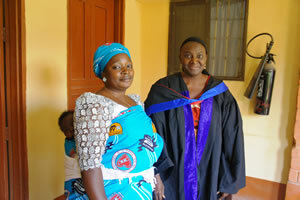 In so doing, the SOLS programme has been able to expand in the countries where it is currently offered. After completing the core, two year programme, many of the students opt to continue serving the community as volunteer teachers – in many cases for 10 years or more. 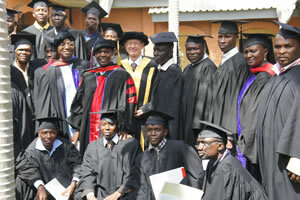 It is this senior group that received GULL’s professional Bachelor degree. (Above right) Students prepare to showcase a traditional dance at the graduation event. The Kingdom of Cambodia has a population of 14.8 million people and its total landmass is 181,035 square kilometres (69,898 sq mi). The country is bordered by Thailand to the northwest, Laos to the northeast, Vietnam to the east and the Gulf of Thailand to the southwest. After years of isolation following the Vietnam War and the rise of the Khmer Rouge who took control of the capital Phnom Penh in 1975, this war-ravaged nation was reunited under the monarchy in 1993 and has seen rapid progress in economic and human resource development while rebuilding from decades of civil war. (Above left) A colourful display of traditional dancing at the SOLS-GULL graduation in Cambodia. 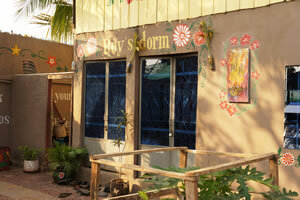 (Above right) Entrance to the male dormitory - the SOLS campus in Phnom Penh accommodates hundreds of young adults. A key feature of the volunteering experience with SOLS 24/7 is the opportunity it affords for personal and professional development linked to cultural cross- exposure and travel. As students complete their programme and opt to join the volunteer staff team, they are assigned to leadership roles in their own as well as other participating countries. This builds confidence and fosters shared learning as volunteers from East Timor work in Cambodia (or elsewhere) and vice versa. 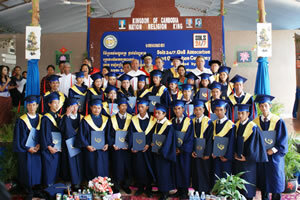 (Above left) The first group of volunteer teachers to receive GULL’s professional Bachelor degree in Cambodia. (Above right) Every SOLS campus is operated and managed by its students. 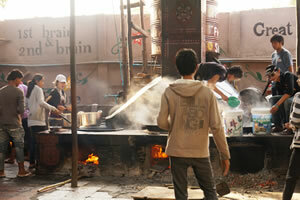 The photograph shows the Phnom Penh campus kitchen with wood-burning stoves. The city of Jos (elevation 1,238 metres), is the administrative capital of Plateau State, central Nigeria. The city has a population of some 900,000 residents (2006 census) and since 2001, violence has regularly blighted the city and the surrounding region. The disputes centre on the rights of the indigenous Berom/Anaguta/Afizere groups and the rival claims of the Hausa-Fulani settlers to land, power and resources. Indigenous-settler conflicts are not new to Nigeria, but the country is currently experiencing widespread intercommunal strife, especially in this region. In addition to ethnic conflict, religious tension between Christians and Muslims have intensified in recent years and the Government has not been able to stem the tide of violence. It is in this desperate context that the church and community mobilization process (CCMP) is beginning to make a difference. 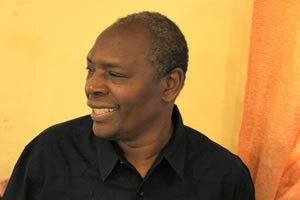 (Above left) Dr Francis Njoroge, Founder of Africa’s CCMP movement. For the past four years, CCMP founder Francis Njoroge and his co-facilitators Ruth Dul and Danladi Musa have been training the first wave of CCMP facilitators in Nigeria with funding support from Tearfund, the UK-based charity. The principles of CCMP draw on Bible stories to encourage poor communities to work together. Armed with biblical knowledge, the facilitators train local churches, inspiring them to make the most of the resources they already have to lift themselves and their communities out of poverty. (Above right) Ruth Dul (Right) co-facilitator of the CCMP training in Nigeria, prepares for the CCMP with GULL graduation event. 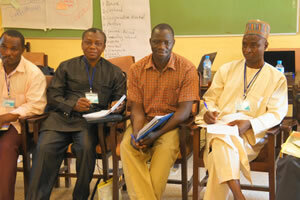 (Above left) Twenty-seven senior church and NGO leaders have been trained to lead CCMP in Nigeria. 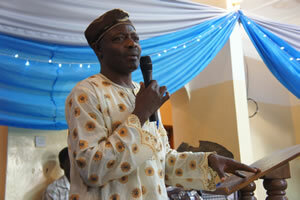 (Above right) An NGO leader speaks at the CCMP-GULL graduation event on Friday, 22 February 2013. The CCMP-GULL graduates now know how local churches can be envisioned and mobilized so as to transform their communities through practical action. The training (since 2009) has meant that CCMP has been implemented and there are already many stories of transformation. The trainee facilitators were drawn from CCDP (COCIN Community Development Programme (CCDP), People Oriented Development (POD) of ECWA, EYN Integrated Community Based Development Programme, CAPRO Mercy Ministries, CRCN Integrated Development Programme, RURCON and Christian Holistic Development Foundation (CHDF). 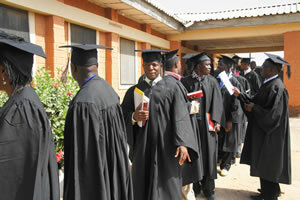 (Above left) CCMP-GULL graduates will assist in the creation of a network for Nigeria. 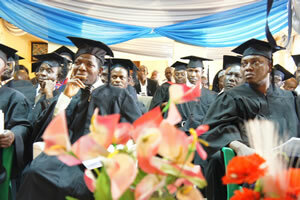 (Above right) Graduands listen to the invited speakers prior to receiving their professional Bachelor degree. GULL is a non-profit public benefit corporation registered in California, USA. 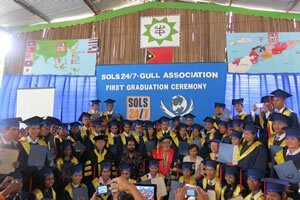 GULL’s mandate to confer professional awards is based on a statement of recognition offered in perpetuity and signed by the Head of State and the Prime Minister of Papua New Guinea on 10 April 2007. GULL is also endorsed by other Governments, Leaders and Institutions. The first quarter profiles the work of SOLS 24/7 with GULL in East Timor and Cambodia and the church and community mobilization process (CCMP) with GULL in central Nigeria. Established in 2000, SOLS 24/7 has worked with some 90,000 young adults in seven South East Asian countries. The Plateau State, central Nigeria is currently experiencing intercommunal conflict arising from land, power and resource disputes. Given this scenario and and high levels of ethnic and religious tension, CCMP is beginning to make a difference.